If you follow me on instagram you saw that I have been loving camo (and olive green) lately! I just think it is such a great pattern for fall, and is also easy to incorporate into that awkward transition period between seasons. 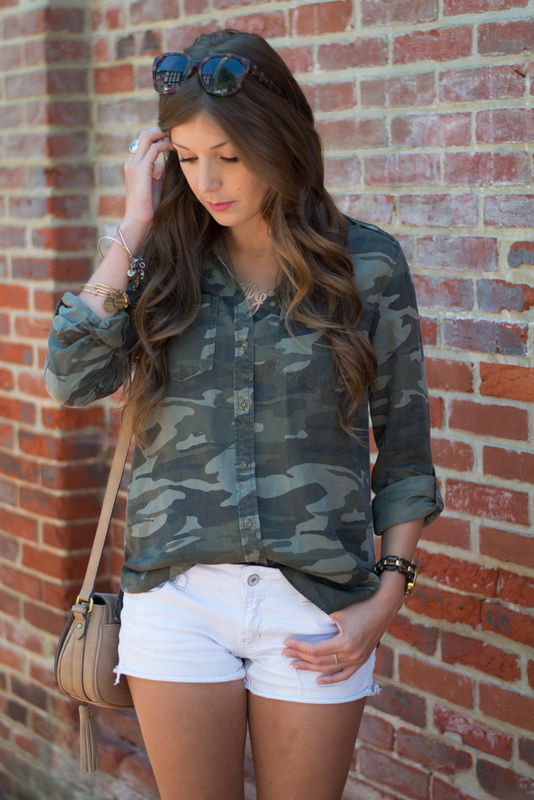 I absolutely love this camo top! It's a little thicker than a normal button down, so it is perfect for those cooler fall nights. You can pair it with a pair of jeans, or you could even layer it over top of a plain tee! Love the camp jacket!! I need one for fall! Super cute look! 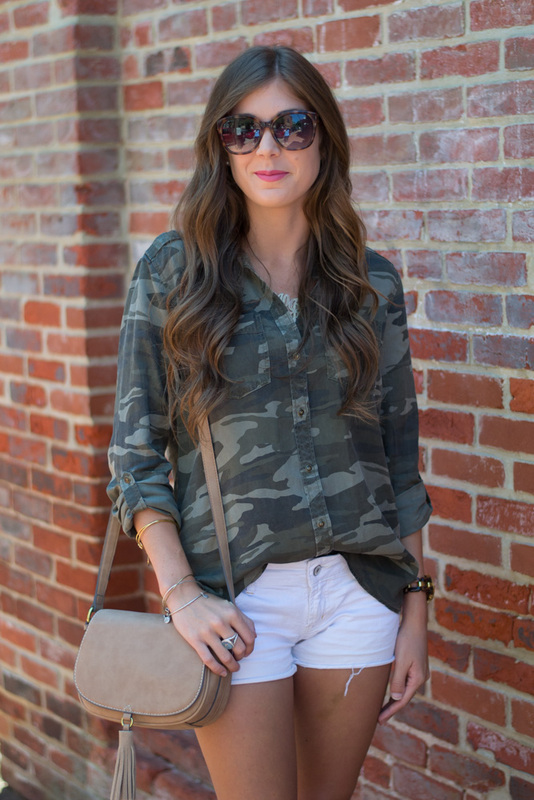 I love how you styled the camo - it is gorgeous! And your hair is beautiful! Major goals!! Girl, me too! I'm obsessed with camp right now! That top is perfection! Love the olive green and white combo! And those bangles--super like. Soooooo...I may be stealing/being inspired by this whole look. hahaha I love it all..the camo button down, the white bottoms and the booties!! It's PERFECT for this time of year!! You look gorgeous!! Ok, so ummm...this is PERFECT!! You look amazing, girly!! love this look! great for transitioning into fall! I have been on a camo kick too lately, I've been wanting to buy everything I see! Love that button up, it's so cute! 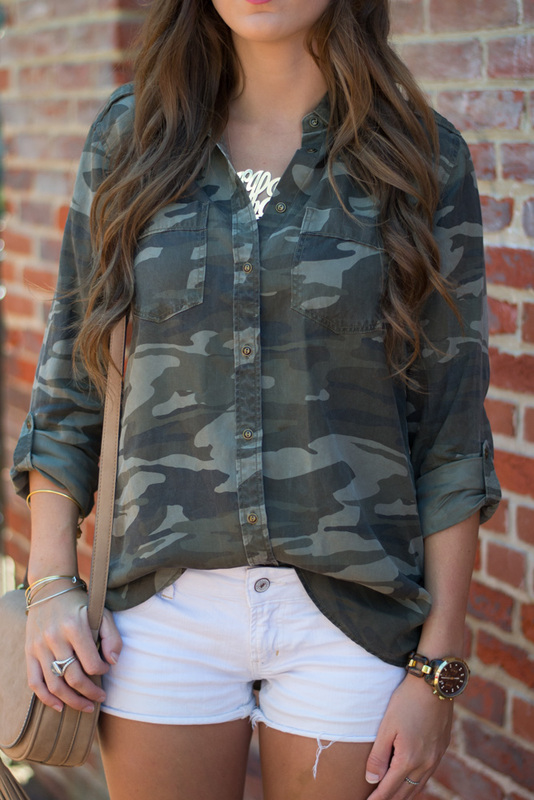 Love that camo top! So fun! I LOVE how you styled this! It still looks so girly and cute... That's always my hold up with camo but you killed it!